Paul Manafort, Donald Trump's campaign manager, is being tried for money laundering, keeping some 15 illegal foreign accounts, and cheating the government out of the taxes he rightfully owed, among a host of other crimes. Manafort joined Trump's presidential campaign in March, 2016, having offered to work for free, and tried to persuade delegates to back trump. On June 20, 2016, Trump made Manafort his campaign manager. Manafort was intimately involved in running the campaign, overseeing millions of dollars, campaign strategy, and staffing. Manafort was involved in the infamous meeting on June 9, 2016, with Russian agent Natalia Veselnitskaya, set up by Emin Agalarov and Vladimir Putin, which Trump and his son Don Jr. are said to have attempted to get hacked dirt on Hillary Clinton from the Russians. The quid pro quo would be the lifting of Magnitsky Act sanctions on Putin cronies and oligarchs in Russia who allegedly had been involved in the murder of political opponent. As campaign chair, Manafort had a plank taken out of the Republican platform that pledged military aid to Ukraine to fight Russian incursions in the east. 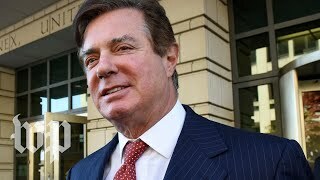 Manafort had allegedly received over $12 mn from the pro-Russian Ukrainian Party of Regions at one time headed by Ukrainian president Viktor Yanukovych. When this allegation became public in mid-August, Trump fired Manafort after the latter's six months of direct service, and brought the fascist white nationalist Steve Bannon aboard in the campaign chairman position. Manafort's business associate Rick Gates has rolled over on him, providing the Federal government with information on the illegal activities that the two engaged in, and admitting along the way that he, Gates, had defrauded Manafort of some $800,000. Manafort's firm represented the Saudis for several months at one point. The firm is alleged to have gotten money from the Pakistani Inter Services Intelligence to promote the cause of Muslim separatists in India's Kashmir province. There is nothing wrong with Kashmir's people wanting better governance, but the whole affair was likely a false flag operation. Behind the scenes, Manafort was providing the only value added he knew: connections. He would make The Call. To the movers and shakers. Congressional representatives, senators, powerful people in Washington. Because of Manafort's long association with them, he was a known quantity. They would take the call from him, give him his 15 minutes of lobbying time. (I was once told by a staffer in Congress that a representative's day is divided into 15-minute segments, in which lobbyists one after another come to her or him to lay out what their clients' wanted.) The implication was that the client would donate to the Congress-person's campaign. Running for national office is expensive, mainly because of the cost of radio and television ads (which however ought to be nationalized and made free).